Gamma-ray binaries are binary systems comprising a massive star (typically of spectral types O or B) and a compact object. Most of the radiated power of these systems is emitted in the gamma-ray energy regime (i.e. photon energies larger than 1 MeV), which sets them apart from other binary systems, like high-mass X-ray binaries, novae and colliding wind binaries. The compact object could either be a neutron star or a black hole. The emission can be powered by the rotational energy loss of a pulsar and produced by particle acceleration in the shock between the winds of the massive star and the pulsar wind nebula. This is the case for PSR B1259-63, the only system where the compact object could be identified . Alternatively, the emission could be driven by accretion of the stellar wind onto the compact object and the formation of jets, in so-called microquasars. In the Milky Way, only 5 such objects are known: PSR B1259-63, LS 5039, LS I +61 303, HESS J0632+057 and 1FGL J1018.6-5856 (see  for a review). They have orbital periods between 3.9 days (LS 5039) and more than 3 years (PSR B1259-63). The gamma-ray emission is typically modulated with the orbital period of the system. The peak of the emission can be rather short compared to the orbital period (e.g. 1FGL J1018.6-5856) or spanning more than half of the orbit (e.g. LS 5039). The MeV/GeV and TeV emission may be in phase (e.g. 1FGL J1018.6-5856) or out of phase (LS 5039). The TeV emission may be aligned with periastron of the orbit (e.g. PSR B1259-63) or with inferior conjunction (e.g. LS 5039). In order to understand the gamma-ray production mechanisms, it is necessary to observe many different systems with varying orbital shapes and orientations. In order to identify new gamma-ray binaries, Corbet et al. performed a blind search for periodic emission in the data obtained with the Fermi Large Area Telescope. These authors discovered that the gamma-ray emission of the known, but previously unidentified gamma-ray source LMC P3 is periodic with a period of 10.3 days. This source is located in the Large Magellanic Cloud, making it the first extra-galactic gamma-ray binary. The companion star is an O5 giant, and the binary system is located inside a visible supernova remnant. With this association the age of the binary system can be assumed to be the age of the supernova remnant of 100.000 years . Fig 1: Phase-folded H.E.S.S. gamma-ray light-curve of LMC P3. Phase 0 is defined at MJD 57410.25, the maximum of the MeV/GeV emission. 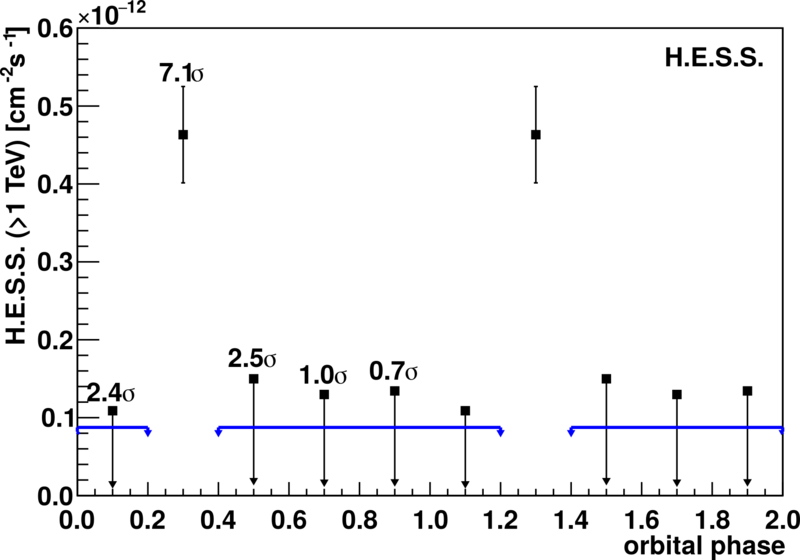 The blue lines indicate the upper limit on the gamma-ray flux in the off-peak part of the orbit (orbital phase between 0.4 and 0.2). The Large Magellanic Cloud has been observed extensively with H.E.S.S. since 2004 for a total observation time of 277 hours. At the position of the binary system the acceptance-corrected exposure is 100 hours. In this data set a TeV gamma-ray source has been detected with a statistical significance of 6.4 sigma which is positionally coincident with the location of the binary system. In order to test for variability and periodicity of the signal, the data set has been divided into 5 parts of roughly similar exposure and covering different parts of the orbit. This phase-folded light-curve is shown in Figure 1. The source is detected only in one phase bin, orbital phase 0.2 to 0.4, with a statistical significance of 7.1 sigma. Considering the 5 trials (the 5 different phase bins), this corresponds to a post-trial significance of 6.9 sigma. The phase-folded light-curve is clearly variable, and the gamma-ray emission can be attributed to the binary system. Figure 2 shows an animation of the significance maps in the individual orbital phase bins. Fig 2: Significance sky maps in the individual orbital phase bins of LMC P3. The cross indicates the test position, the grey circle illustrates the angular resolution of the instrument. 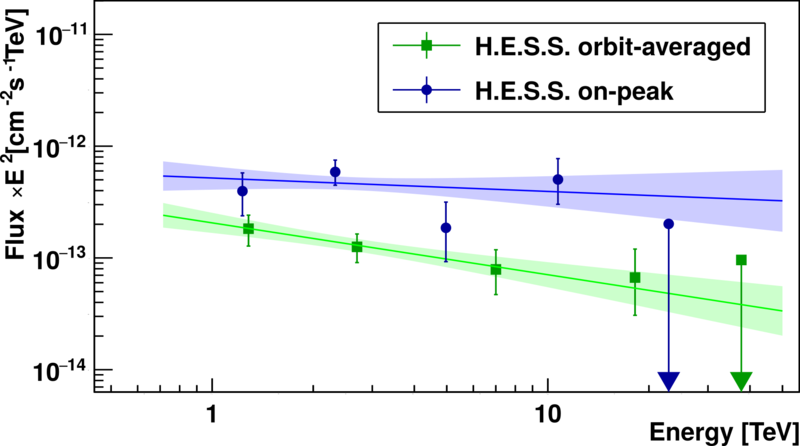 Figure 3 shows the spectral energy distribution of the emission averaged over the entire orbit (green) and for phase bin with significant emission ("on-peak", orbital phase 0.2 to 0.4, blue) only. The spectra can be fitted with a straight power law, without a high-energy cut-off. The spectral index of the on-peak flux is 2.1± 0.2, the orbit-averaged spectrum appears slightly, but not significantly softer. The integrated flux above 1 TeV of the on-peak emission is (5± 2)x10-13 cm-2s-1. For a distance of 50 kpc, this corresponds to a luminosity in the 1 to 10 TeV energy range of 5x1035 erg/s, which makes this object by far the most luminous gamma-ray binary. Fig 3: Spectral energy distribution for the full orbit (green) and the on-peak part of the orbit (blue). Two main scenarios are usually invoked to explain the gamma-ray emission from gamma-ray binaries: particle acceleration in a pulsar wind nebula (PWN) driven by the spin-down of the pulsar or accretion of the stellar wind on the compact object. The on-peak gamma-ray luminosity of 5x1035 erg/s is about the same as the luminosity of the PWN N 157B in the LMC. N 157B is driven by the spin-down of its central pulsar PSR J0537−6910 with a spin-down luminosity of 5x1038 erg/s. A putative pulsar in LMC P3 would need about the same spin-down luminosity. This would make it one of the four most luminous pulsars. That such a luminous pulsar remains undetected so far can be explained by absorption in the stellar photon field of the companion star. In the accretion scenario a luminosity of up to 1036 erg/s can be generated by the conversion of gravitational potential energy of in-falling material, assuming a typical mass accretion rate of 10-10 solar masses per year on a neutron star with 1.4 solar masses and a radius of 10 km. A significant amount of the accretion luminosity needs to be converted into TeV gamma rays in order to explain the observed emission. For the first time TeV gamma rays have been detected from an extra-galactic binary system. It is by far the most luminous gamma-ray binary. In order to provide for the observed gamma-ray luminosity either a pusar with a very high spin-down luminosity or a very efficient accretion of the stellar wind onto the compact object is needed. H. Abdalla et al. (H.E.S.S. Collaboration): "Detection of variable VHE gamma-ray emission from the extra-galactic gamma-ray binary LMC P3", to be submitted.